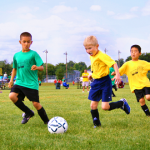 Gambling and betting in youth sports? Impossible you say, well think again. In Broward County, Florida, 9 men were arrested recently and charged with felony bookmaking for illegally gambling on youth football games. Peewee football bringing in cash! ARE YOU KIDDING ME? The big game, the peewee super bowl had a pot of more than $100,000. Little kids, but big money! Whoops, did they forget about the fact that youth sports are all about FUN? You talk about adding parental pressure now to win, wow. 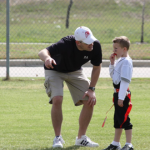 Just think if a parent had a few thousand dollars riding on the game and you fumbled the ball. No dinner for you tonight! 1. The possibility that a six year old could turn one red vine into two red vines by just making an extra touchdown is a good teaching tool, right? 2. Think of all the math they will be learning when they try to figure out the odds in gambling. What is a better bet, a game with 8-1 odds or a game with 7-2 odds? First grade math teachers across the country should really appreciate this extra help. 3. And what about learning consequences; if you can’t pay off your losses, you get “roughed” up a little by the 6th grade bully at recess. This is only training kids to be responsible bill payers when they get older. 4. Think about how much more they will learn about the game. Before placing a bet, they will need to spend lots of hours watching game films of the other teams to recognize possible weaknesses in a team that when exposed to a team with strengths in that same area, this could be the prime opportunity for big money. Teaching “due diligence”, and the importance of doing the homework. 5. With the right bets, your normal $1.00 a week allowance could take a big jump to $1,000.00 a week. And think how much more they could make if they learn how to “throw” the game. The earnings could be limitless. Think of all the candy and soda pop they could buy with this added income. 6. The snack bar people could really see an increase in sales. See, this could be a huge benefit for many people! The snow cone sales will sky rocket! The peewee pixie stix will more than double in sales. 7. These kids can start their 401-k accounts at an earlier age, and get a good jump on their retirement account. 8. Think of the life of leisure they will have with a big winning streak. They wouldn’t have to get jobs as an adult. They could just sit around and watch TV and play video games all day while their friends go to work and have to earn a 40-hour a week paycheck. What a great teaching tool, sit around at home and let your savings earn interest for you to live on. 9. These kids will learn at an early age how to deal with pressure. Most kids have the light responsibilities of cleaning their rooms and eating everything that is on their plate. But not these kids, they have the extreme pressure of not throwing an interception that could cost someone thousands of dollars. Great preparation for a high-pressure job later on in life. 10. Gaining lots of friends. Just think of all the wholesome, ethical friends they will make and hang out with who are also living in this world. Or, maybe we should stop treating these games and these kids like this, take away all the outside pressure and craziness, and just let the games be fun. This is unbelievable! Are you kidding me? Let’s bring back the FUN!!!!! Playing for fun is “priceless”!